Where do I even begin with Stonehenge!? There is so much ground and information to cover. As many Prehistoric artworks, there is much shrouded in mystery. 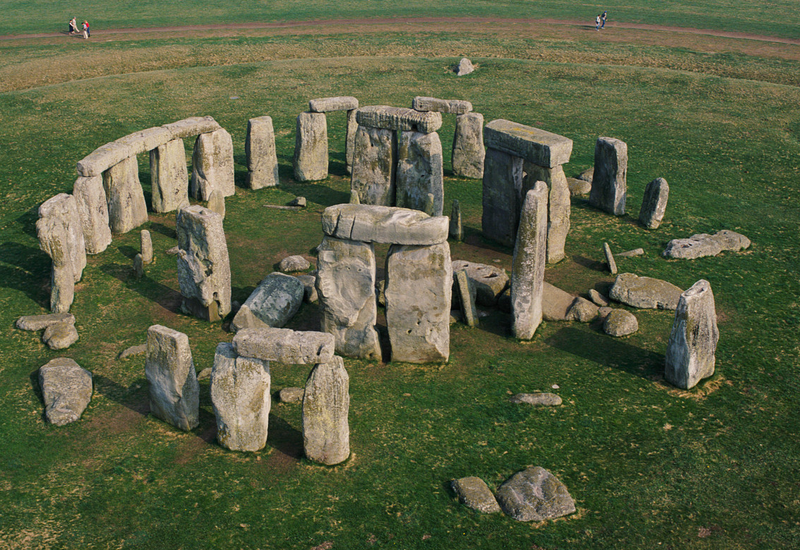 With Stonehenge ,the two biggest questions that come up are: How did they build this? What was it used for? Archeology can provide some theories to help us solve this conundrum but not the concrete answers we would love. There is evidence that the site of Stonehenge was used hundreds of years before those enigmatic stones were erected. The fact that this site was consistently used for so long attests to its importance as a sacred site. What is a sacred site? Well in short, it is a location that holds ceremonial, symbolic, and/or religious significance to a culture or civilization. Some of the largest stones weigh up to 50 tons!!! Holy cow! This fact begs the question how it was possible for Prehistoric people, with little advanced technology (compared to today), to move these stones and then place some on top of each other. Honestly, the theories abound here and there are a million different things to look at. I largely skip the discussion of how Stonehenge was built in direct teaching and leave most of the information up to the NOVA Secrets of Stonehenge documentary we watch in Humanities. However, one aspect I find pertinent is that the construction of Stonehenge gives us insight to what must have been a highly structured society. Someone had to direct the manpower to build this monument and there had to have been segregated tasks performed over a long period of time to accomplish this feat of engineering. In addition to the society structure, I also focus on the placement of the stones and what they can possibly tell us about Stonehenge’s function. There are two big theories I cover in class: burial/ceremonial & agricultural/planetary. I find these two theories most useful for my classes and they just make the most “sense” for me to teach. The first theory is a cross over: burial/ceremonial. Really any sacred site can be said to also be ceremonial because that is literally part of the idea of what sacred sites are for. Ceremonies can range to be a number of things but we have clear evidence of burials at Stonehenge. Clear evidence as in dead bodies…like 30 of them. The most interesting thing to me is that these bodies are of young, healthy, males; not people who are perishing of sickness and old age. Archeologists figure their deaths may have been part of the ceremonies acted out at Stonehenge. If the bodies were of elderly people or sickly children, it would read a whole different narrative. One can only begin to guess why a society would kill its strongest, fittest members. The second theory is not a contradiction to the first theory, more of an augmentation. I’ll pull the two theories together in a second, but let me address the concept of the agriculture/planetary theory first. As you can see from the diagram above, the circle of stones (cromlech) has an altar stone in the center (hard to see in this image) which lines up with what is called the Heel Stone down the avenue. This alignment matches up with the sun rise on June 21st: the summer solstice. Coincidence? I think not. So here’s where I bring this all together and throw in some context. Why would there be dead healthy males buried at a site that has these huge megalithic stones in a circle matching up with the summer solstice? I mean seriously, why bother!? The going theory is that all of these items are connected to some agricultural rite or ceremony (perhaps with human sacrifice!?) Only a society that relies on farming would care about the summer solstice. We can therefore safely assume that this was a highly structured Neolithic society that was dependent on successful agriculture to survive and therefore stationary. Isn’t it great how we can pull all that information with no writing!? There are numerous resources on Stonehenge so these are just the ones in my personal arsenal. Next time: #9 The Ambum Stone. Ambum Valley, Enga Province, Papua New Guinea. c. 1500 BCE. Greywacke.